The cheapest bug out bag is not pretty. It will not get any compliments from any prepper, or any person for that matter. The cheapest bug out bag may not be the Rolls Royce of survival tools, but a cheap bug out bag can keep you alive. By using what you already have laying around and the cheapest components available, you can be prepared to get out of dodge. With the list below we are assuming you want to spend as little as possible but still have a great shot of surviving when SHTF. The total for this list tallies in just under $100, assuming you plan on purchasing everything to put it together. If you have a spare clothes, that lowers the total $3. If you have a spare bag, that lowers the total $9. 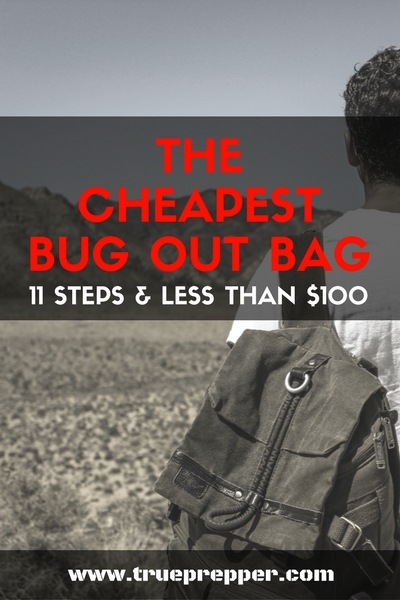 You get the picture- you will be spending much less than $100 and be prepared for the worst with this basic, inexpensive bug out bag. Choose any wearable bag you may have laying around that is large enough to hold the rest of the contents! If you don’t have anything that you can spare, I found this duffle on Amazon for $9 at the time of posting. You may be able to find a luggage bag even cheaper locally- especially thrift stores. Get something with a shoulder strap, and try it on to make sure it is comfortable before buying it. Grab a gallon or two of water and a few cans of tuna, spam, peanut butter, and canned vegetables. You are supposed to plan for a liter of water and 500 calories a day (minimum). Those amounts will be very uncomfortable, so this is a great area to add too if you can carry the weight. You should at least shoot for three days, which is about 1 gallon of water and 15 cans of tuna. That diet will make you miserable and keep you hungry, so buy a variety of canned goods that are high in calories vs weight. If you get the water in smaller containers, like bottled water, you will be able to store them inside the bug out bag. Otherwise, you should consider tying the gallon jug to the outside of the bag to keep it from bursting by accident. This is really an item you should grab from your local thrift store. They always have old pots and pans for ridiculously low prices laying around. Grab a small pot, make sure it looks like it doesn’t have any cracks or leaks, and head to the checkout! If that sounds too tedious, here is a simple camping pot. This component is one of the most important and is not an item to skimp on. Yes, you can just grab a steak knife from the drawer but no, it is not the same. The survival knife is used extensively for creating fires, cutting cords, opening cans- the majority of survival activities rely on it. It can even be used for self defense if needed. The Morakniv Companion is not only relatively cheap as far as knives go- you will not need to upgrade this knife later. There are a few things you need to stock up on here. Okay, maybe more than a few. Grab a basket. Tarp – Get a size you can fit in your bag or roll up and tie to the outside. Keep it cheap and patch with duct tape if needed. Use this as a shelter if needed. SOL Emergency Blanket – cheaper and more effective than Mylar blankets, this is simply worth picking up. Tape a few together and you have an emergency bivy. Being able to boil water, cook food, and just generally light things on fire is important for survival. You don’t need to spend much here, but make sure you have at least two options “just in case”. BIC Lighter – pick out a cool looking one that is brightly colored. You don’t want to lose it. Ferro Rod – don’t just have one solution to create fire. A ferro rod makes a great backup to a regular lighter. Tie, wrap, stick, tether- the possibilities for these are endless. Zip Ties – an amazing invention allows you to secure anything. Lightweight and cheap, they are worth carrying in your bug out bag. 550 Cord – I’m sure you are surprised by this one. Use the cord for many, many different applications. Use it to suspend a tarp for a quick shelter too. Duct Tape – As an engineer, I am always told the joke about fixing stuff with either duct tape or WD-40. I am of the belief that you can throw away the WD-40 and just use the duct tape. Wire Coat Hanger – Grab one from your closet, bend it down so it is small, and use it for all sorts of things in a survival situation. Survival wire might be better for snares and traps, but we are aiming for the cheapest bug out bag here. Printed a map of your local area with your own computer, your work computer, or a friend’s computer. If you are printing 8.5” x 11”, you may want to print a few pages so you can get some landmarks visible. Then pick up a map compass, and you should be good to go in this department. While a multi-tool is definitely a “you get what you pay for” type of tool, this Stanley multi-tool is the exception. It beats any other multi-tool at this price point and provides a huge amount of functionality for your bug out bag. Not to mention, it includes your backup survival knife. While a first aid kit is a very important part of a bug out bag, we opted to go with one of the cheapest comprehensive options available. This first aid kit has enough stuff in it to get by. You may want to add some over the counter or prescription medicine as you see fit. Get these out of your drawer and throw them into your bag. You may want to roll them into a skivvy roll first, but either way, these should be easy to find. Although we are talking about the cheapest bug out bag here, don’t go picking your worst pair of socks and tighty whiteys- you may be wearing these for an extended period. Again, if you don’t have any to spare, head to your local thrift store. I would not advise picking up the undies there, but it’s your bag and your choice. 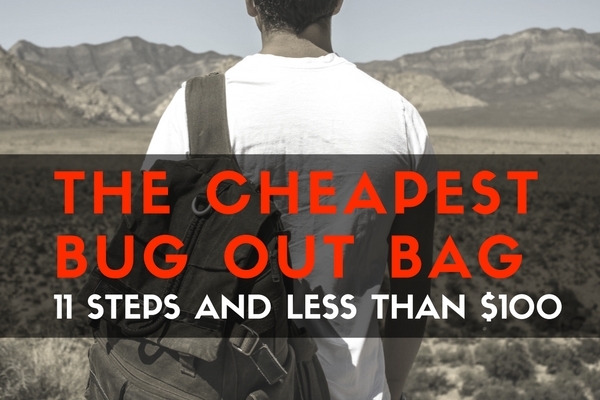 The cheapest bug out bag doesn’t have to be a bug out bag that fails you on your first dry run. You don’t want to lug around crap for it just to break when you need it the most. If you followed this guide, you can rest assured that you spent the money in all the right places to avoid this happening. Using your money efficiently is not just smart prepping, it is plain smart. Another thing that is smart is getting to know your bag. Make sure you can carry it when it is packed, and that you know how to use every item in it. Training and knowledge is always more important than stuff. Keep exploring, stay prepared, and be safe.